The flag of Floriana, Malta is "based on" --actually identical to-- the arms of Grand Master Antonio Manoel de Vilhena (reigned 1722-1736), "per fess Argent a lion Gules the head Or and Gules a winged arm clothed with a maniple Or holding a sword Argent": http://www.smom-za.org/smom/grandmasters/66.htm. 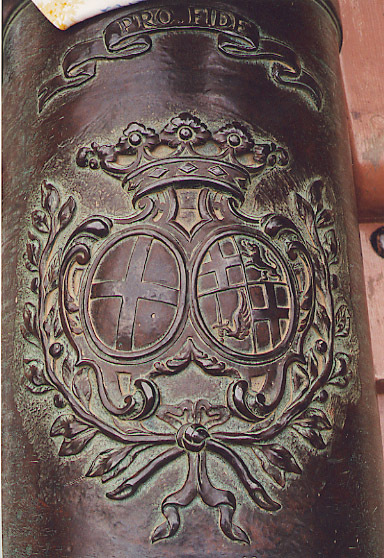 The arms can be clearly seen (though in uncoloured stone), quartered as usually with that of the SMOM, in these two photographs of the Mdina gate and of a 1726 cannon guarding the co-cathedral of St. John (Valletta): http://www.heraldica.org/topics/national/malta/malta16.jpg, and http://www.heraldica.org/topics/national/malta/malta43.jpg. "Grand Master Manoel de Vilhena was a wealthy and lovable but firm Portuguese aristocrat of royal descent. The inscription on his magnificent mausoleum in St. John's affirms this with the words "he was not elected but born a prince". He was a benevolent and popular ruler. To meet the demand for housing and accommodation in Valletta he laid the plans for the building of a suburb in the neighbourhood, Floriana, where his statue still stands today at a prominent place outside the Maglio Gardens. He built Fort Manoel in Marsamxett Creek, and also the Manoel Theatre which is believed to be the second oldest theatre in Europe and is still in use today." "The sword of Grand Master Anton Manoel de Vilhena is the latest source of controversy in the local council of Floriana. "The whole issue revolves around the authenticity of the current council’s coat of arms featuring the emblem of the patron Grand Master: a lion and a sword on a white and red background. 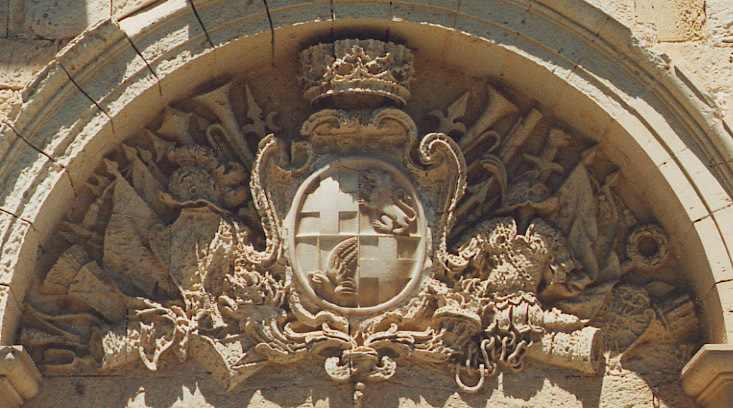 Former Mayor and now independent councillor Nigel Holland, together with other vehement Furjanizi, want to remove the sword, insisting that the Grand Master only granted the lion from his own coat of arms when he inaugurated the Valletta suburb and named it Borgo Vilhena. "The fountain with the statue of a majestic lion guarding the entry into Floriana, built by the Grand Master around 1728, as well as several other representations of the lion on historic local emblems, seem to give credence to Holland’s case, but the mayor disagrees. Holland insists the sword was erroneously inserted in the council’s coat of arms and “imposed by central government” when it set up the first local councils back in 1993. He is proposing a council motion “to rehabilitate the coat of arms, in respect to history and to our forefathers” and to adopt the official one bearing “the red lion on a white background, as it should be”. "The motion is expected to be put to a vote on 22 March. Up until then, the Grand Master’s sword will keep hanging over the Valletta suburb." Mayor Agius' research appears to be quite good: GM La Cassiere (1572-1581)'s arms was indeed "Argent a lion Gules", and, moreover GM Vilhena frequently used, not the lion, but the winged arm with sword alone, for instance on coins minted during his reign, as can be seen on this stamp: http://www.smom-za.org/images/smomgm66_3.jpg.